I would go so far as to say I was actually looking forward to my second appointment. 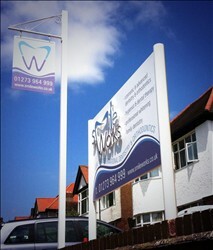 This is a lovely clinic with attention to detail all the way and a dentist who gave me honest good advice with options. It's clean and the atmosphere was calm and relaxing which for me was very important. I had a very good experience at this practice. From my initial dealings with staff via the telephone to the aftercare I received following treatment. It is a lovely clean and fresh clinic. Dr Horsley is incredibly gentle and dealt with a problem I have been trying to get sorted for a very long time. I just wish I'd found him sooner. I would highly recommend him and his lovely staff. I wanted to take the time to thank the team at Smile Works, I'm not the best of dental patients but Dr Simon Horsley really did help me feel at ease. SmileWorks is a private clinic in Brighton offering comprehensive dental services - from routine dental hygienist therapy and advice through to complex cosmetic, orthodontic and restorative dentistry solutions - each individually tailored to clients unique requirements and gently delivered with expert calm in discrete impeccably clean ultra-modern facilities.